I can remember watching Aladdin in the theaters and realizing that I wanted to animate…in 2D. 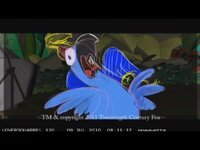 When I started my degree in computer animation at Ringling, I took a course in 2D animation and was happy as a clam. Unfortunately around the same time there was a movement in the industry by a few notorious executives that “2D was dead”. Ugh…It still makes me sick to my stomach. So I put aside my aspirations of being a 2D animator and focused on actually learning how to use a computer. I never stopped drawing. Even when figure drawing was no longer a requirement in the later years at Ringling, I would spend time at a figure drawing club called FEWS and I would spend a great deal of time drawing everything with my buddy Ben Sprout. Once I got into the industry, I was amazed to find that most of the animators didn’t draw. I even heard some people claim that they didn’t need to know how to draw. I still feel like the better animators out there can thumbnail ideas and successfully pitch their ideas with drawings alone. I am a mentor at animationmentor.com and I am relentless in telling my students how important drawing is to animation. In my opinion, there is NO BETTER WAY to learn the basics of body mechanics and posing than figure drawing. Shortly after the completion of Ice Age 2, I started playing around with a program called Plastic Animation Paper. I can remember using it to turn around ideas very quickly to the director at the time and it proved to be extremely efficient. I can remember asking Blue Sky studio to consider buying the software and they went a step further. With the guidance of Scott Carroll and I, a R&amp;amp;amp;amp;D genius named Hugo Ayala created an in-house software that is much more intuitive than anything available on the market to this day. Blue Sky has embraced this work flow and is still used to this day. Here is a shot that I animated on “Rio” showing it’s progress from it’s 2D choreography through it’s completion. I am extremely happy to report that my new job at 38 Studios has fully embraced and supported this work flow of mine. I now use a program called FlipBook to pitch ideas, but it’s nowhere near as intuitive as Hugo’s program. If Blue Sky ever decided to market his software to the public, I’d be first in line.